LED Lamp Market size was over USD 18 billion in 2016. 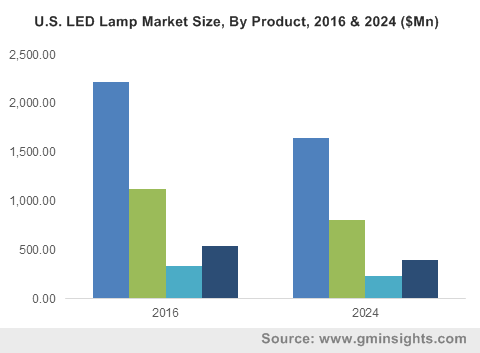 Increasing consumer demand for energy efficiency and enhanced lighting systems, reduced prices, and increased technology penetration in general lighting will drive the LED lamp market. Stringent government policies across the globe favoring these bulbs by banning inefficient lighting systems and energy consumption are expected to augment the industry demand over the forecast period. However, factors, such as the dominance of fluorescent bulbs and low awareness levels among users may LED lamp market growth. The decreasing prices of energy-efficient bulbs are attracting large organizations to use these products in large-scale installations. Thus, governments are supporting energy-efficient lighting globally through subsidies. For instance, the Government of China has started an intensive promotion of eco-friendly and energy-saving products. The Government of India has initiated UJALA scheme to provide these lamps at lower rates for saving energy. Various countries have taken up projects such as the building of smart cities, better roadways, and flyovers for developing their infrastructure. LEDs are used in all these recent projects due to benefits such as high efficacy, low heat, and longer life. Developing countries including China and India have a huge population and are opting for such projects. These factors are expected to drive the LED lamp market. The demand for general-purpose lighting is anticipated to witness a surge over the forecast timeline. Decorative LED lamp market use cases are primarily residential spaces for lighting up gardens, pools, fountains, and statues. They are also used for functional applications consisting of building facades and landscaping. Rising consumer inclination towards energy-efficient lighting systems is projected to augment the general-purpose LED lamp market share over the forecast timeline. The general-purpose bulbs are evolving as a replacement for conventional lighting systems, further escalating demand. Lighting accounts for a considerable percentage of the overall power consumption. LEDs consume lesser energy as compared to other lighting technologies. Despite higher purchase costs than incandescent bulbs, they require less operational costs, owing to reduced energy consumption and high durability. As a result, governments of various countries have supported the adoption of this technology through incentives, banning incandescent lights, and other awareness programs. LED lamps are used to provide the same aesthetics delivered by the traditional incandescent bulbs accompanied by the energy saving capabilities, which propel its demand in the residential space. They are dimmable and available in different color temperatures. These bulbs are widely adopted across various commercial spaces, such as healthcare, retail, and hospitality, to deliver enhanced illumination capabilities and offer direction to the end users. The LED lamp market price trend is on the decline. This reduction is a result of reducing prices of chips, major components of these bulbs. Increasing competition led to an oversupply in 2012; this resulted in a decrease in the average selling cost. These lamps have quickly gained adoption by replacing alternatives such as electrical discharge, filament, and halogen lamps. They are used for commercial and residential purposes in both indoor and outdoor uses. Startups in the LED lamp market have increasingly started to distribute their residential and commercial bulbs and luminaires to consumers bypassing traditional distribution channels. The direct marketing channels, such as e-commerce, are rapidly gaining acceptance than whole selling as bulbs and ballasts can easily be stocked and ordered. The automation of the manufacturing process has reduced the input costs of developing light sources, playing a significant role in decreasing the overall cost. Government regulations in countries such as Canada and the U.S. are major factors influencing the reduction in LED lamp market pricing. The U.S. has initiated a ban on the usage of ineffective lighting and rebates to reduce the energy use. Europe LED lamp market share accounted for over 25% of the revenue in 2016. Modernization in the Europe region has increased the demand for smart homes and smart lighting options. The operational costs and long product life cycle of energy-efficient lighting are key reasons inducing the growth in this region. The European Commission has set requirements for energy-efficient solutions in residential, industrial, and public areas. Established manufacturers, such as Philips, Osram, and Samsung, need to recreate their policies as the lighting revolution has dismantled the existing strategy landscape. Companies are adopting vertical integration across the value chain. For instance, in July 2011, GE acquired Lightech, which makes electronic drivers. In November 2012, GE acquired Albeo Technologies, which was involved in manufacturing fixtures. Many LED lamp market manufacturers are moving down the value chain to gain value in solutions and luminaires owing to an increased competition in this industry. For instance, in July 2011, Osram acquired Siteco for gaining broader market access in lighting solutions. Similarly, in August 2011, Cree acquired Beta-Rudd lighting to gain the industry share and increase the adoption of energy-efficient lighting. The ongoing energy-efficient lighting revolution has disrupted the LED lamp market in significant ways. The industry, which was dominated by three bulb manufacturing companies, Philips, GE, and Osram, is now witnessing incredible fragmentation as numerous new manufacturers have entered the business. LED lamps use a semiconductor device that emits visible light when an electric current pass through it. Recent improvements in these bulbs, such as efficiency, output, and cost, made them suitable for large-scale lighting use in business, households, and other places. These bulbs are more environment-friendly than other bulbs. General-purpose high-quality products utilize high-performance technology. These are highly durable and can replace halogen or incandescent bulbs. Decorative bulbs are used for decoration purposes in homes, hotels, showrooms, retail stores, and other places. Decorative bulbs are playing a crucial role in retail and hospitality sectors by attracting customers. A-type, decorative, directional, small directional, linear fixture, and low/high bay LED lamps are used for indoor applications. These bulbs are also used in area/roadways, parking lots, parking garage, and building exterior applications.